Built at the New York Steinway Factory in 1917, this Steinway Model B is a wonderful example of historic Art Case piano design. The Model B has long been considered to be one of the world’s most ‘perfect pianos.’ Measuring just under seven feet, these semi-concert instruments are often chosen due to their wonderful balance of size and sound. It is common to see these pianos utilized by professional pianists and as performance instruments at appropriately sized venues. Steinway Model B #180473 was crafted during the pre-WWII ‘golden era’ of Steinway Factory quality. The quality of workmanship and the materials available resulted in some of the finest grand pianos ever manufactured. As the development of the modern piano began to culminate, more and more work was put into turning the cabinet of the piano into a work of visual art. This Steinway Model B features a Rococo, Louis XV Style Art Case Cabinet. It boasts delicate carvings across the cabinet and is supported by gracefully curved, hand-carved legs. When we secured this instrument for restoration, we were very encouraged to see that the original woodwork was in excellent condition and required very minimal repair. The cabinet is covered in a rich, Circassian walnut veneer. This figured wood has a deep, almost three-dimensional appearance and fits the style of cabinet very nicely. The cabinet was refinished in a closed pore, hand rubbed satin finish and the brass hardware was polished and sealed. An exacting restoration process was performed on this Art Case Steinway. The original soundboard was carefully restored and refinished and the original factory pinblock was restored as well. The cast iron plate was re-bronzed and the raised lettering was hand detailed. New high-quality music wire and custom manufactured bass strings were installed to blued tuning pins. The damper back action was restored and regulated. The action was fully rebuilt utilizing the highest quality parts. This included new genuine Steinway hammers hung on Renner shanks, new flanges, and German Renner wippens. Expert action and tone regulation/voicing was performed to ensure a fine playing experience. The action was weighed off to Steinway specifications which results in a very responsive keyboard. This piano produces a wonderful quality of tone with a clear singing treble and a rich bass section. This is a project that we were elated to complete and we feel it is one of the finest Art Case Steinways we have available today. Today, similar Art Case designs are available on smaller pianos, so finding a concert level Model B in this style of cabinet is quite rare. Our expert piano technicians have spent hours beyond the norm ensuring this instrument is of top concert quality. With a stunning figured walnut cabinet and a rich tonal quality, this Steinway Model B is a wonderful example of historic Steinway & Sons Factory quality. During the pre-WWII era, quality was high and craftsmen had access to the finest cabinet woods and other materials. The level of quality was incredible during this golden age of the piano. This tradition is one we have dedicated ourselves to continuing here at Chupp’s Piano Service. Our showroom and rebuilding facility feature a large selection of fully restored pianos for sale. 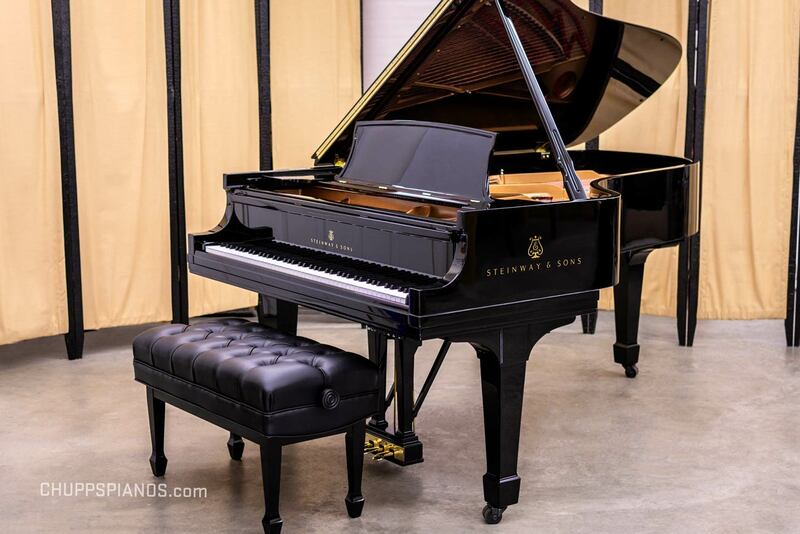 For over four decades our specialty has been the refurbishing, restoration and repair vintage Steinway & Sons grand pianos. The Art of Piano Rebuilding is truly art you can feel! Error: Error validating access token: Session has expired on Thursday, 10-Jan-19 19:00:02 PST. The current time is Wednesday, 24-Apr-19 23:05:56 PDT.